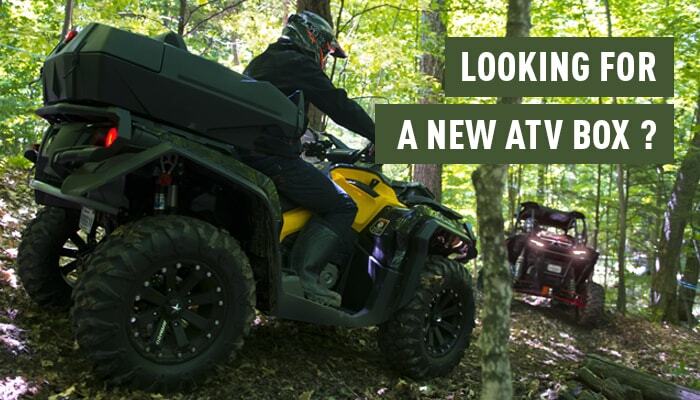 Are you looking for a new trunk box for your ATV? If you would like more information to help you select your next purchase, you are in the right place. One of the first questions to ask yourself is: what use are you going to make of it? 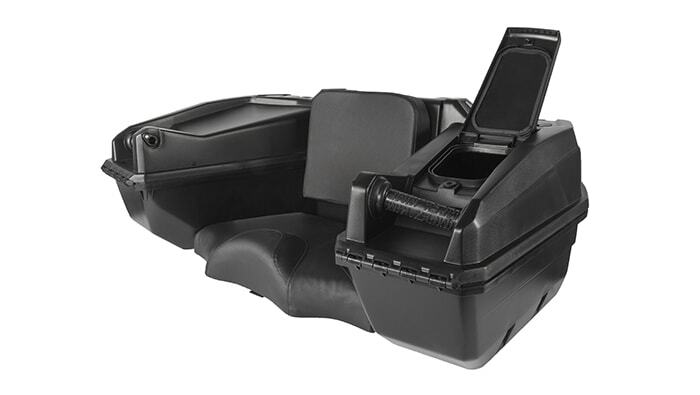 Do you have your eye on a trunk box that will give you additional storage for your hunting equipment, allow you to enhance your passenger’s comfort, and maybe even both? First we have the traditional storage trunks that mount on your ATV rear rack. They are often sized well and rather plain looking, and usually provide the largest storage capacity compared with other types of trunks. You can customize your trunks by adding many different accessories allowing you to bring along everything you need, either in summer or in winter. This type of trunk is essentially the best way to add much more storage space. As you probably already know, some trunks are equipped with a backrest to enhance your passenger’s comfort. It is an important feature to consider if you ride with someone because the addition of the backrest takes up some of the storage space. Some riders will see this as a way of combining comfort and storage space. We also offer trunks that mount on your ATV front rack. Designed along the same lines as the previous one, these trunks become very practical due to their ease of access and their often high cargo capacity. Combined with a traditional storage trunk box, these trunks allow you to maximize the storage capacity of your vehicle. You will be surprised to see how much stuff you can store in. Most importantly, you have to make sure they are compatible with your vehicle so as not to hinder your visibility or the proper handling of your vehicle – though most have been specifically developed for this purpose. You must ensure that the trunk you choose suits your needs. Before you decide to buy a trunk, are you sure you know about everything you really need? Here are some important features to consider in order not to regret your purchase later. Size: Itemize what you need storage for. (It is recommended to account for more, not less). You will find much information on the size and storage capacity on the product pages at www.kimpex.com! Special features: Some trunks provide more mobility than others: for ex., the Nomad trunk has compartments and removable covers to allow for transporting oversized items. Some trunks also have quick access compartments or a fuel can slot. Another important factor is the gasket: check if your next trunk has a gasket preventing water and dust ingress. Some other trunks are equipped with additional lights that provide increased safety on the trails. Fastening system and compatibility with your vehicle: Is your trunk compatible with your vehicle? You would certainly not want the unpleasant surprise of finding out that, once you have unpacked everything in your garage, something does not fit. Usually, with some exceptions, several types of fasteners are included with the trunk. Safety, comfort and accessories: Some trunks provide a locking system to keep your objects safe; such a system comes either with an integrated key, or a device that allows adding your own lock. This feature will surely offer you the peace of mind. Your passenger’s seated position is also very important as it is often that person that is most “tossed around” on your machine. If you like to ride again and again with a companion, then provide a bit of comfort such as ergonomics, heated grips, arm rest, and why not some foot rests while you are at it! Do you now have a better idea of what you want? I invite you to discover more on the Nomad trunk box here.